The easy way to measure cooking ingredients is to do all the cooking measurements at once and dump all the ingredients into plastic bags. This may work well for dry ingredients that can be pre-mixed but there’s always some measuring of teaspoons and tablespoons that needs to happen in the field. 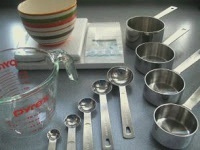 Here is a guide for food storage limits, common cooking measurement and conversions presented into a chart so you can remember how many teaspoons in a tablespoon and how many tablespoons in a cup. You may get it printed and this may come in handy. Have fun trying! Milk, non-fat dry 6 mon. Ask Numbers – This is a fun one as it includes things like speed, power and shoe size! The cooking calculator is not food specific. Not Recommended: Many food sites have a widget on their sites called the Culiverter. This calculator is not food specific which is why I do not recommend using it.